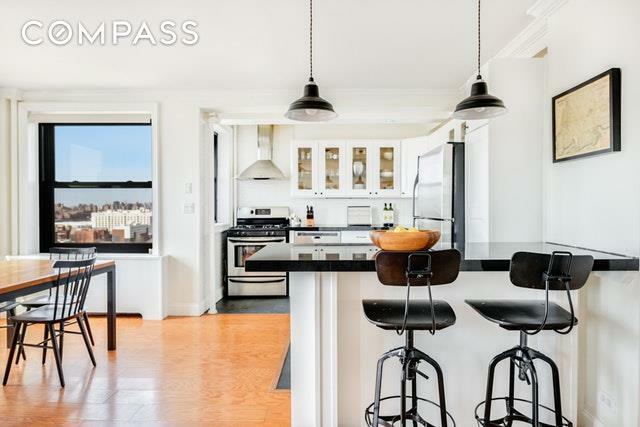 This rare combination unit at the Clinton Hill co-ops is an enviable combination of panoramic views of Manhattan and Brooklyn, private outdoor space, oversized windows throughout, and ample closet space. A corner unit perched on the fourteenth floor, youre perfectly poised for beautiful sunrises and sunsets. 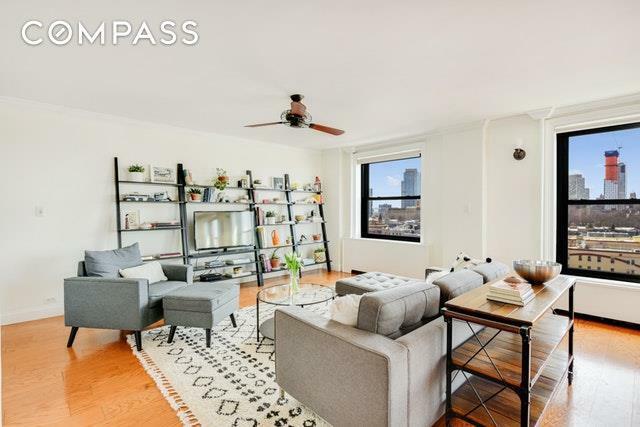 The well-appointed, ~1,400 SF two bedroom, two bathroom apartment offers an expansive layout that is easily convertible to a three-bedroom, with room to spare. Updates from the current owners include a new kitchen, bathroom, new mouldings and new 7-inch oak hardwood floors. Enter into the apartment through the foyer, and you are instantly dazzled by light streaming through the wall of windows in the sprawling living room. Chefs will delight at the sunny, open kitchen with ample cabinet and counter space for cooking with an easy flow between the dining room. Ideal for entertaining, the open living/dining area easily accommodates any size dining room table, while allowing for a very comfortable living room. Off of the living room, there is one full renovated bathroom with penny-tile floor and white subway tiles. Down the hall on the terrace, your own oasis above the treetops allows you to spend lovely evenings dining al-fresco, plant your own personal rooftop garden, and relax with friends and family on warm days, all with stunning views of the city below. The two bedrooms are tucked away on the other side of the apartment with multiple closets and another full bathroom with marble tiles. Each bedroom is oversized and can fit a king-sized bed plus space for a home office. 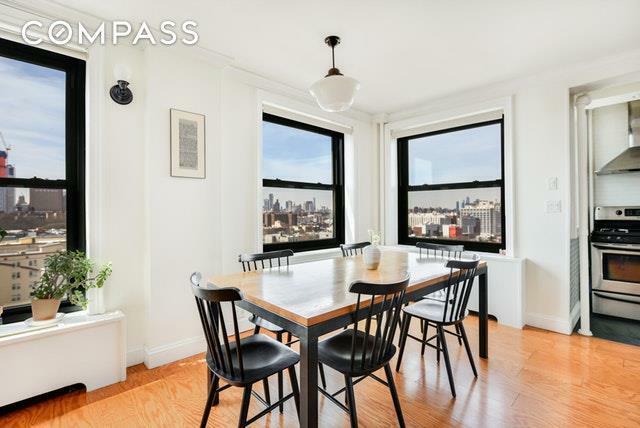 The corner unit has especially stunning views and windows on multiple sides. With eight closets throughout, this apartment is an organizers dream come true! The Clinton Hill Co-ops are a well-maintained 12-building, 1,200 unit community in a lush park-like setting, featuring 24-hour security, live-in staff, package and bike rooms, and laundry rooms. Not to mention, utility bills are low with self-generated power. Favorite neighborhood restaurants along Dekalb Ave include Dino, Evelina, Graziellas, and Colonia Verde. Around the corner, Myrtle Ave hits include Pecks and Gentleman Farmer. On Saturday, wander through the Ft Greene Park Greenmarket for farmers market shopping and through the historic park itself. Cultural offerings at Brooklyn Academy of Music and the beautiful Pratt Sculpture Garden are also at your fingertips. Transportation options include the G and C train, B52 bus and the trains of Atlantic Ave-Barclays a 20-minute walk away. 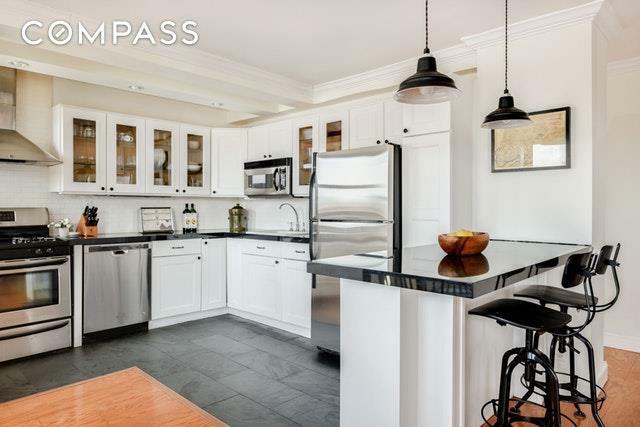 Listing courtesy of Debra Bondy of Compass.